Through collaborative storytelling Capital Institute’s award-winning Field Guide to a Regenerative Economy takes us to the places where the Regenerative Economy is already operating in the real world, supporting enterprises and practices that empower individuals, and that regenerate human communities and the natural systems upon which all life depends. Once we understand its principles and patterns, we see the Regenerative Economy coming to life in rural areas and in cities, in small, medium, and large enterprises around the globe, and in the networked relationships among them. 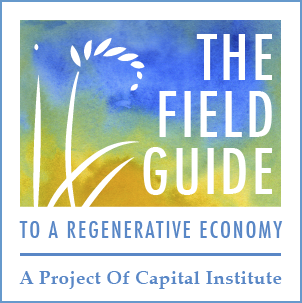 To immerse yourself in the Field Guide's various stories (cateogized by Finance, Land & Food, The City, Ownership Models, and Doors of Perception), please visit Fieldguide.CapitalInstitute.org/Stories.html.